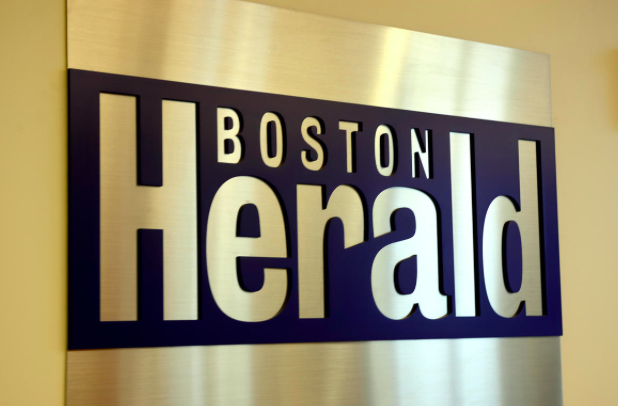 As the hardreading staff has previously noted, we’re one of roughly 17 home subscribers to the Boston Herald, which means that virtually all of the feisty local tabloid’s dwindling print circulation comes from newsstand sales. The sneaky local tabloid does say that the price increase “will not affect home-delivered copies of the Boston Herald,” which has up to tens of subscribers issuing a sigh of relief. Still, that’s a one-third newsstand hike from Saturday . . .
. . . to today. Which means the pricey local tabloid now costs the same as the Boston Globe. The Herald’s newsstand price is also now double that of the New York tabloids, which, to be fair, are constantly waging price wars. Rising above the fray, the New York Times newsstand price is $2.50. Two and a half times more for the broadsheet? That seems closer to the natural order of things, no? A Chelsea family with Chechen roots has filed a $105 million libel suit against journalist Michele McPhee and a handful of news outlets that referenced a story she wrote for ABC News in the wake of the Boston Marathon bombings, claiming the article had a disastrous impact on their lives and personal relationships. The Herald’s web version doesn’t provide a link to the Universal Hub post or McPhee’s ABC piece. Worse, it doesn’t mention that McPhee is a former reporter and columnist at the dodgy local tabloid. You’d think they might’ve included that. Then again, the Herald piece was quick enough to name the other defendants in the libel suit: McPhee Productions, ABC News, The Daily Mail, Heavy, Inc., News Corp. Australia, DMG Media, the New York Daily News and anti-Islamic activist and journalist Pamela Geller. A lot of deep pockets there. Crosstown, at this moment anyway, the Boston Globe has nothing on the story. More, no doubt, to come. Stop the presses! 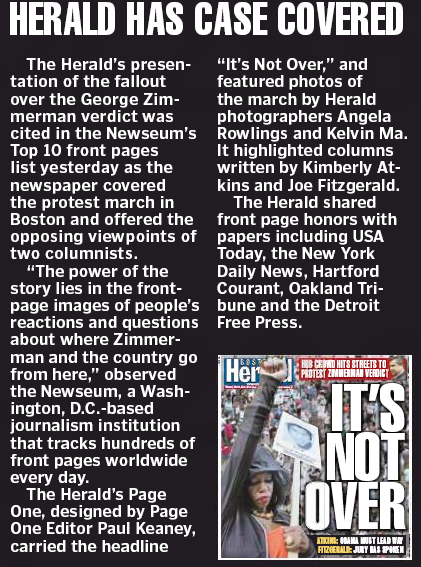 The Boston Herald made The Newseum’s Top Ten Front Pages on Monday. In the aftermath of George Zimmerman’s acquittal for the shooting death of Trayvon Martin 17 months ago, people took to the streets Sunday in cities across the country to protest the not-guilty verdict. 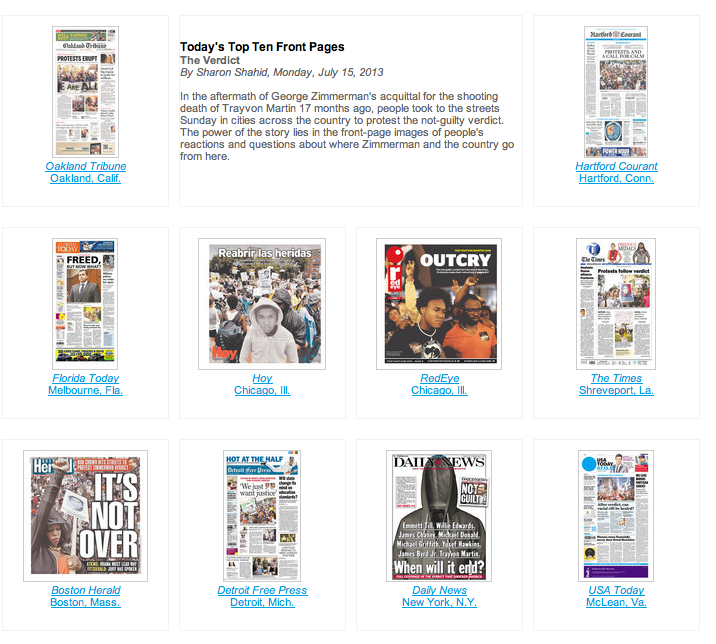 The power of the story lies in the front-page images of people’s reactions and questions about where Zimmerman and the country go from here. 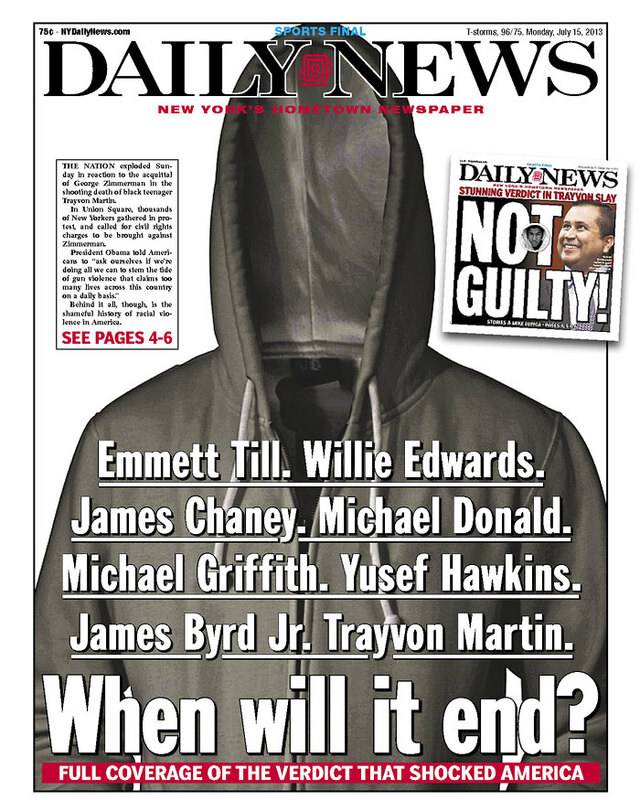 Also noteworthy but too small to read: the New York Daily News Page One. Mediaite called it an effort to “irresponsibly gin up hatred and sell newspapers” in contrast to the “measured” editorial that ran in the same edition. The hardreading staff is not on this earth long enough to spend time finding out if any other Top Tenners toss the confetti in their own papers, but we’re guessing they don’t. Just one more way the Herald is special.